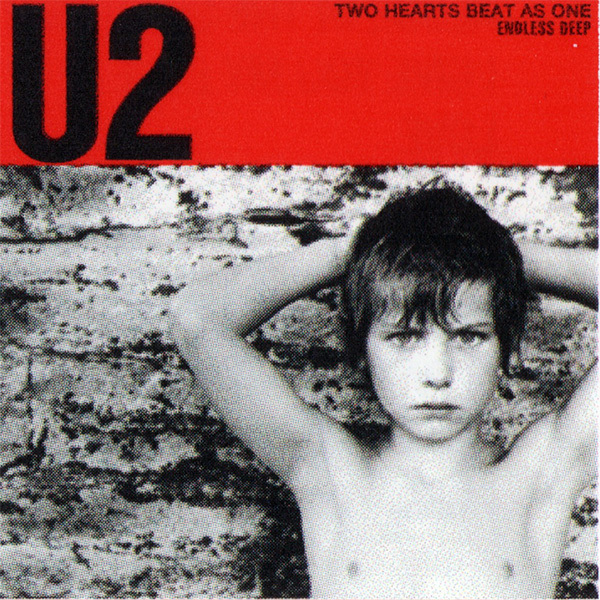 Bono wrote the song on his honeymoon and it featured on the War album. The cover of the single features Peter Rowan, the brother of Derek 'Guggi' Rowan, who was to appear on several U2 sleeves. The single made its first appearance at a U2 show in Dundee on February 26, 1983 in the War tour opener. U2 also performed the song on the UK's Top of the Pops on March 31, 1983. When U2 performed it during their first appearance in Japan on November 22, 1983, Bono inserted snippets of Marvin Gaye's Sexual Healing. At a Simple Minds concert on June 28, 1986 in Dublin's Croke Park, support band In Tua Nua performed Two Hearts Beat As One and Bono later guested during the Simple Minds show. Francois Kevorkian provided several dance remixes on the double pack and 12" formats of the single. The UK 12" also featured a remix of New Year's Day with alternative lyrics and an extra verse. The remix also appears on the Sunday Bloody Sunday single. It ranked as the 5th most popular single in New Zealand's Rip It Up poll that year. A 1994 Polygram sampler called Sound Savers No. 5 featured the song. The Royal Philharmonic Orchestra, on 'Pride:The RPO Plays U2', also covered it. It's full of passion and love, just love it, and a lot of energy too.